Acclaimed for her incisive true-crime journalism, Linda Wolfe has explored some of the darkest aspects of human nature. But never before had she felt as visceral and disturbing a reaction as she did to Ricardo Caputo, the object of an international FBI manhunt, who in 1994, after twenty years in hiding, turned himself in and confessed to the brutal murders of four women. Caputo's arrest propelled Wolfe on a deeply affecting, personal odyssey. Some ten years earlier, the author's friend, poet Jacqui Bernard, had been murdered, and Wolfe had become convinced that Caputo was the killer. Now, seeking closure in Bernard's death, Wolfe met with the families of both Caputo and his victims; she spoke with police and private investigators, psychiatrists who had treated Caputo, and lawyers on both sides of the case; and she pored over private letters, diaries, and photo albums. She also conducted three prison interviews with Caputo. What emerges is not only a frightening and unforgettable portrait of a serial killer, but a powerful and poignant evocation of the lives he touched, twisted, and destroyed. 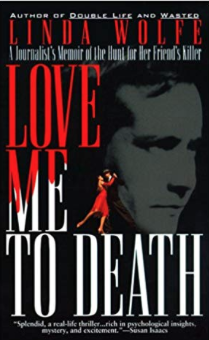 Love Me To Death is more than a triumph of investigative journalism. It is a candid, compelling story of innocence and evil, crime and punishment -- and of Linda Wolfe's own determined quest to unmask and face the enemy.